If you are familiar with Twitter and Gmail, there’s no reason that you should not know about Linux. For long synonumous with geeky, ugly and difficult, it has over the past years evolved into something quite the opposite. My reason for starting with Linux in the first place, was that I had harddrive problems – which in fact is quite common when you’re using computers. However, the Windows (XP) tools available to do diagnostics and edit partitions, does not really exist. Say you want to shift some of the free space on the C: drive over to the D: drive, Windows cannot really help you out. Browsing the web for help, I found gparted – and even better – GParted Live CD. This Live option enables you to run programs and tools directly from a removable medium, without altering the system harddrive. I then discovered that the GParted was actually launched from an operating system that was started from a CD. Linux. I was awed. Ubuntu has been cheered the distro that took Linux to the masses. I started using this in 2008 before moving to Canada, so that I could access data back home. And since then I have truthfully upgraded home server and also desktop version of Ubuntu. Having a interest in web developing, I found the Linux desktop environment far more flexible in terms of connecting to ftp and ssh accounts, and seamlessly integrating this into a regular file browsing. There are of course downsides when it comes to available software, and trying to adapt your existing computer habits into a Linux experience. For years, Skype was terribly difficult to get to work with audio – and don’t even mention video. Bluescreens doesn’t exist in Ubuntu, but intense multimedia experiences – like Skype – may cause hang ups, then blackout, and eventually present the login screen over again. Unity – the new interface. For some reason, introducing something new seems to be the only way to display that something really works. Bottom line is, it doesn’t. The pop-up «start menu bar» is far too slow, button effects tacky, and menus terribly unintuitive. One of the key applications for adding and removing software – Synaptics – had some serios troubles with translations in the previous release. I spent a few hours fixing this, as the application at this points was completely useless. It was fixed for a period of time, which was good. But amazingly, the problems reoccurred in the latest release. Ubuntu One. This is a cloud sync software that can span across devices and OS’es. 2GB free, then you start to pay. The system itself is «ok», but is in my opinion too prominent throughout the system. Software updates. Say there is a tiny change in a software, you would have to download the entire package again. With Fedora Linux, you download the changed code lines, and the software is «prepared» locally. Faster, more efficient, and way more elegant. And for some reasons, things have started to run slow. Originally, Linux distros would «boost» your computer performance. I recently installed Fedora Linux on a removable drive, and this was actually running more smoothly than the Ubuntu running from inside the coputer. This was what finally convinced me to make the change. 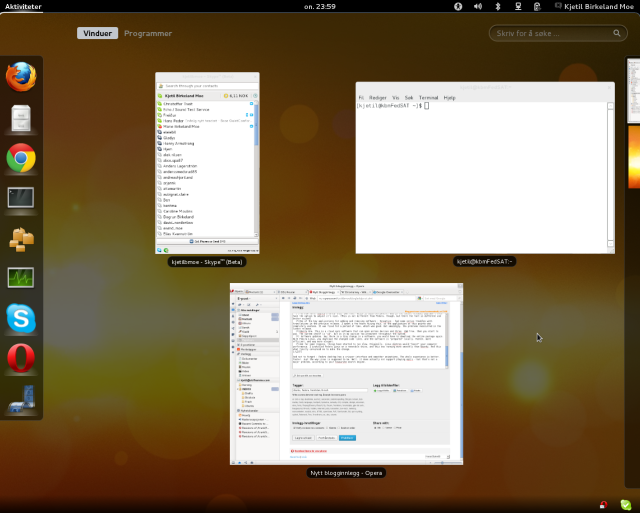 And not to forget – Fedora desktop has a crisper interface and smoother animations. The whole experience is better, faster. Just the way Linux is supposed to be. Well, it does actually not support playing mp3’s – but that’s not a major problem, according to your favourite search engine. Latest Fedora (16) was released just a few days ago. GNOME 3 is used also here, but in a far better way. Workspaces are not fixed, and applications are presented at a glance when clicking «super» button, or moving cursor to the upper left corner. Applications can then be moved from on screen or workspace to another, and applications are rearranged on the fly – smoothly. When building software from sources, install «Developer tools» group first. But you may also have to remove old version of automake/autoconf, as they exist simultaneously. Install VLC from videolan.org. This will also provide repositories for playing mp3-files.